In executing your annual strategic plan, do you know what its impact will be on the future value of your company? As a CEO for 20 years, I’ve led teams in developing and implementing strategic plans for various types of manufacturing and service businesses. What I’ve learned firsthand is the difference between having a strategic plan to drive company performance over the next year or two, versus having a plan you know is also increasing your overall company value. Too often these two objectives – Strategic Plan vs. Company Value Growth – are seen as mutually exclusive, when they should not be. 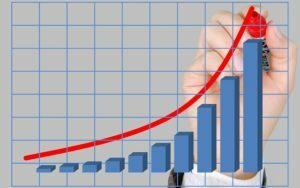 A question I always ask a business owner – in reading your strategic plan, will I see a clear link to how the plan will grow your overall company or enterprise value to one day excite future buyers, and optimize the value of your business upon exit? The answer to this question should be a definitive yes. If your answer is no, this is a gap you must move to fill. 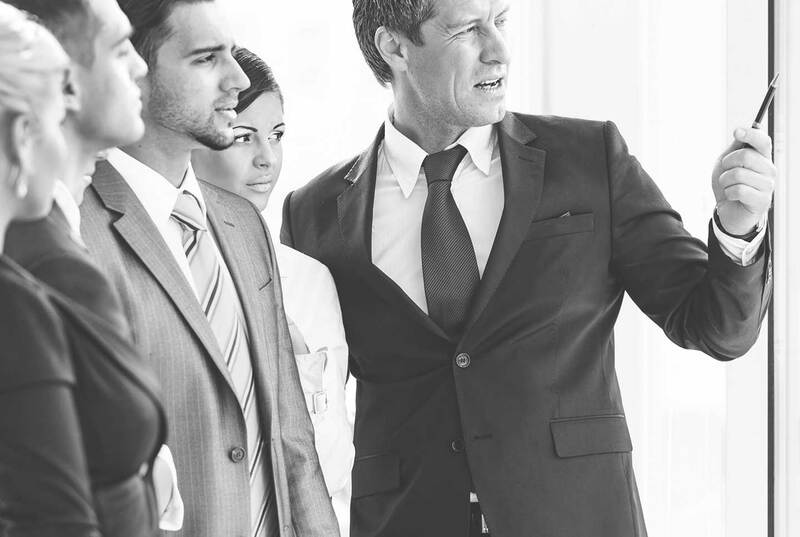 In selling a privately held business of which I was CEO – and delivering the owner’s desired target payout of $200M – my team and I used our unique strategic planning process to establish the direct link to building company value and doing so was crucial to driving the fantastic result we achieved. There are various definitions of a strategic plan. 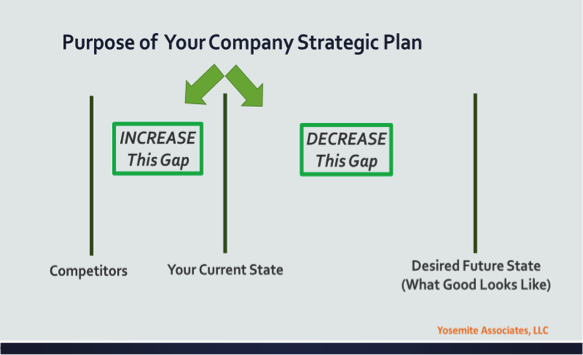 The one I’ve used successfully with my businesses is that strategic planning is a means to an end or simply the path to delivering your “what good looks like” in the future. Once you have identified what good looks like for the future, it’s then a matter of identifying and filling the gaps. 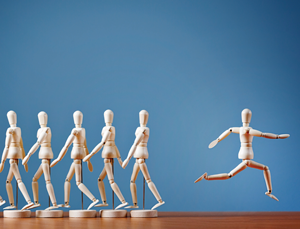 You want to increase the gap you have between your company and that of your competitors and you want to decrease the gap between where your business is today and where you want to be at a future state. To do this, we use a four step strategic planning process that helps you manage these important gaps. Now as to the key question about your strategic plan….does it link to building your overall company or enterprise value that will help you deliver on what good will look like one day? You want to have confidence that you are working on the right combination of things that fill any gaps to ensure that you one day excite multiple buyers and increase the value they will place on your business. 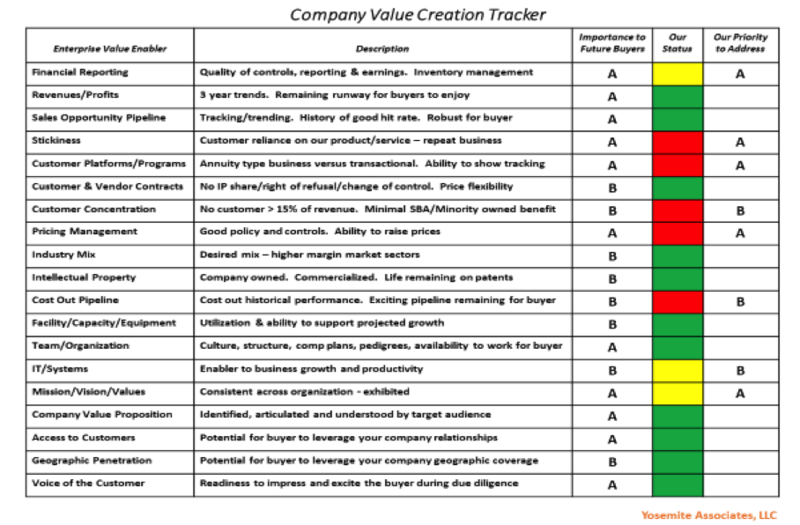 One of the strategic planning tools that we use with business owners is the Company Value Creation Tracker (see illustration). This tool is customized depending on your industry and product/service and facilitates and captures your priorities for exciting future buyers. We use various techniques to help a business owner identify what will be most important to future buyers. In this illustration, the “A” items are those that were identified that would drive company enterprise value in the eyes of future potential buyers. Then the business owner was facilitated using other supporting tools and templates to work through the process of identifying “Our Status” which pertained to their company readiness to support and excite the buyer in the various categories. The color coding provides a quick visual as it relates to the company readiness. By seeing what buyers would be attracted to and knowing the company status, it was then more effective in identifying “Our Priority to Address” – and to build these in to the company strategic plan for addressing. This helped the owner see specifically where they should be prioritizing time and resources to fill gaps. And this gave the owner a high degree of confidence that as the team was executing on the strategic plan, they were, in fact, building future company value to help achieve future exit targets. As I say to business executives, don’t view strategic planning as daunting. There are effective means for developing a solid plan. And in developing your plan, essential to your future company valuation is to link your plan to knowing that you are building overall company value. Don’t work for years on your business only to find one day that it’s not exciting buyers and not delivering optimal value. Start now by following a campaign to Bank your moment™! For more information regarding this insight and to connect with Larry O’Toole, email him at Larry.OToole@YosemiteAssociates.com.